The Transportation Security Administration or TSA, as most American’s call the dreaded but necessary security screenings we all must bare our souls to so we can travel by aircraft, has some nifty tips to hopefully put a smile on your face as you race to catch that holiday flight. If you want to get the low down before you fly high call the TSA Cares hotline at least 48 hours before you hit the airport. The agent on the TSA Cares hotline can give you specific information about what to expect during screening so that anyone traveling with a disability or a medical condition can be better prepared for screening. If you’re a first-time traveler, call the hotline and get your concerns answered, it will make the screening process much easier for you. You can call the hotline toll-free (855) 787-2227, Monday through Friday 8:00 a.m. and 11:00 p.m. ET and weekends and holidays between 9:00 a.m. to 8:00 p.m. ET. You can email TSA (TSA-contactcenter@tsa.dha.gov), but I would call so you can talk to a real person and forgo the delay of getting a response. When you call TSA Cares, they can also set you up with Passenger Support Specialist (PSS) to assist you through security. This person can meet you as you arrive at the airport to assist you through areas of TSA security screening. Your PSS can answer any questions you may have during screening and they can make sure you keep moving through the security process. In busy airports sometimes after putting my belongings on the conveyor belt and watching them go I find I’m waiting at the gate for as much as 5-10 minutes for a “female check” to come and walk me through the area for my screening. Maybe if I have an assistant with me that process might speed up, who knows. Please keep in mind every airport is different and that means the service will be different. No matter if you have an assistant or not you always have every right to ask questions, speak up if you don’t think you are being treated fairly. If you have any issues don’t be afraid to ask for a supervisor. If you still feel you have a grievance, ask for a complaint card and the agent’s names you’re speaking with and file a complaint. It only takes a few minutes to fill out and the people in charge do pay attention to the complaints. Complaints are what created TSA Cares programs. 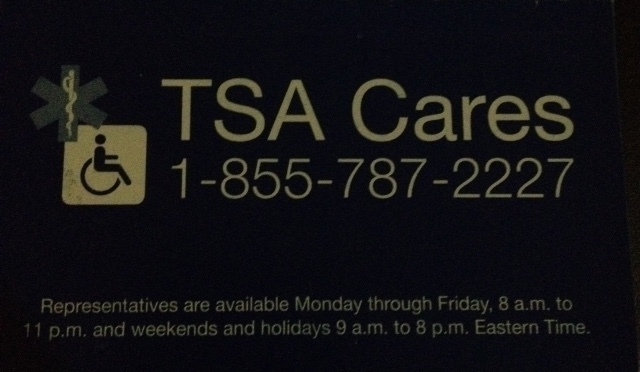 Oh, and speaking of cards, download this TSA Cares card to keep on hand just in case you need some support. Now if you want shorter lines and are willing to pay the fees TSA PRE is a great way to go through security screenings. If you’re a TSA PRE traveler, you don’t need to remove your shoes (if you use a wheelchair or it’s difficult for you to bend down, you don’t need to remove your shoes, just say you can’t remove your shoes and they will swab your shoes). You don’t have to take out laptops, 3-1-1 liquids, take off belts, or mid-weight jackets during the screening process at participating TSA Pre airports. Participating airports is the operative word here because there are times when TSA Pre is closed or the airport doesn’t have that line. All passengers are required to undergo screening at a checkpoint by the screening technology or a pat-down. For TSA Pre wheelchair users TSA officers will perform a modified pat-down. They will swab your hands, wheelchair, any other equipment, say a prosthetic or external medical devices to test for explosives. Any traveling companions must have TSA Pre to pass though this security area with you. Remember, lines will be longer this time of year and if you want some built in ease when traveling, you should arrive at least two hours before domestic flights and three hours early for international flights, to allow plenty of time to get through security screening. I wish you all safe and easy travels, wherever you go and remember to be proactive and speak up. You have a right to be treated with dignity, courtesy and respect. And be sure to give it too!